THE brand for authentic, hand made Maracatu instruments from Pernambuco! 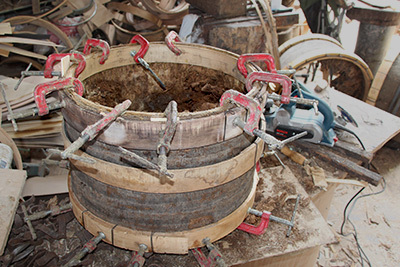 Barravento is the leading producer of hand-made Maracatu instruments in Brazil. Their instruments are played in traditional Maracatu groups as well as in modern formations such as Nação Zumbi or in the bands of famous MPB celebrities. Alfaias, caixas, gongues, agogôs, shekerés, ilus and mineiros, all of which have excellent sound quality. This art is of course also based on Maurelianos experience as a musician and his profound knowledge about the Afro-Brazilian culture of Pernambuco. Maureliano, the head of Barravento, is a musician himself. He used to be active in the Mangue Beat movement, he has been a capoeirista for many years as well as a drummer and director of various Maracatu groups. He also practices the pernambucan stick combat-dance, which is very similar to Capoeira. 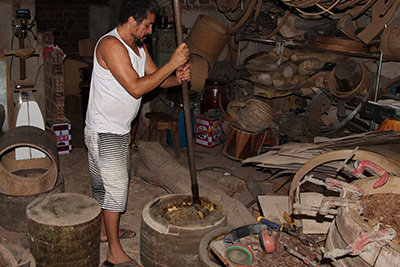 Furthermore, Maureliano Ribeiro is a tireless researcher of Pernambucos extremely rich folk culture. In small plantings, Maureliano grows different trees and bottle gourds so that in the future he will be able to provide a part of his raw materials sustainably by himself. Barravento supports a programme which helps former drug addicts with their social rehabilitation.